Uzuki (Takako Matsu) is a quiet and underconfident young woman who makes the move from Hokkaido to Tokyo to study at university. She struggles to make friends and fit in, all the while dwelling on the reason - initially unknown to the audience - why she elected to study so far from home. 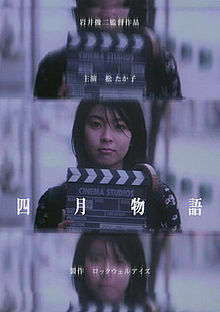 April Story is a Japanese romantic drama written and directed by Shunji Iwai. To a large degree it simply does what it is that all Japanese dramas of this type do: Uzuki is a very traditional, essentially stereotypical protagonist. She quietly struggles to settle into her new life in Tokyo. She does not seem capable of making friends, mainly due to being too shy and insular to speak up or be more outgoing. The film is also near-crippled by an incredibly cloying and twee piano-based score - again pretty much the stereotypical take on this sort of film. On the other hand it is remarkably short: from opening titles to closing credits the film runs less than 70 minutes. It is in the finer details that the film is at its best. Upon arriving at her one-room apartment Uzuki discovers there isn't enough room for all of her possessions, which comically stack up around the place until there's hardly any room to get in or out. After struggling to find a university club to join, she winds up enrolling in a fly-fishing group at the suggestion of a sort-of friend who regularly chats to her but doesn't seem to ever remember her name. There are a string of fairly episodic scenes as she tries to adjust, and relax, and have fun. In one fairly unusual sequence Uzuki goes to see an old samurai movie at a local cinema. The film focuses on the film she is watching for a bizarrely long time, for reasons that are only really alluded to much later in the piece. Rather impressively, the film-within-a-film was specifically created for April Story - from a glance you would not know it. In one of the more effective parts of the film Uzuki keeps returning to the same bookshop and browsing at length before awkwardly buying let more books. It winds up being a bit of a mystery that is only revealed in the film's third act. The film is, despite its flaws, very effectively shot. Iwai uses a variety of different angles and set-ups to highlight Uzuki's various emotional states and situations. Early scenes are filtered in such a way as to seem almost dream-like, emphasising Uzuki's uncertainty and confusing in a new city. Takako Matsu plays the part extremely well: this was her feature debut in a leading role, and she has since established a long career in Japanese film. Despite numerous problems - chiefly playing in a field that has been effectively strip-mined of any original ideas - April Story ends on a wonderfully engaging and uplifting note. Iwai's story choices are ultimately fascinating ones, focusing not on a clichéd romance but on the hesitation and doubt before that romance has even been started. The film's conclusion makes the earlier, more frustrating scenes much better in retrospect. It is a strange film as a result: much better when remembered than when seen.